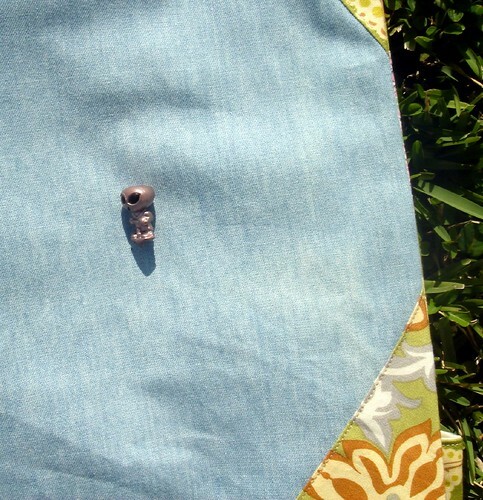 Here's a little peek at this weekend's sewing. There's more, for another day. The top bags are backed in the same denim as the handles. 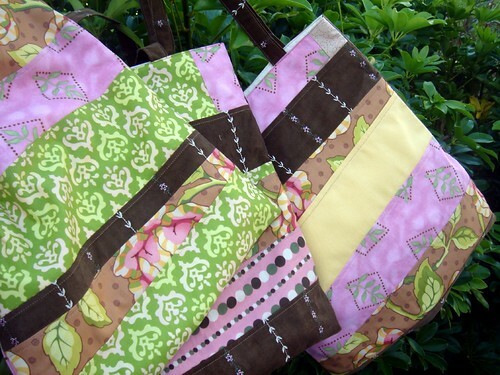 The three bags in the next photo are backed in corduroy, again matching the handles. The bags are all lined and have inside pockets. 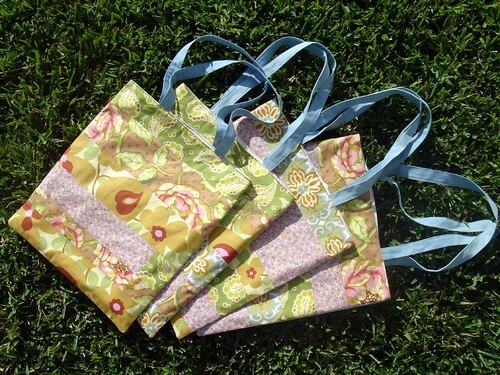 Each bag measures about 13" by 15" ... big enough for school or library books ... or sewing projects. And, just for my brother, I remembered to add my little labels to all of them. These were so much fun to make, but with the craft shows looming I felt really stressed about getting them done (as well as the taxes for the store, school schedules, figuring out layouts/needs for the shows, handbags, backpacks ... I'm sure I'm forgetting something). But they are done, 15 in all. And now I'm off to see if I still have children after my weekend of sewing in seclusion. Oh wait, how could I forget the most important picture taken today. It's K.'s alien, of course. K.'s alien is jumping on a pogo stick, all the time ... even in the house, which is not ok and the alien and I have talked about this, except of course that the alien isn't really real and doesn't really talk ... (it's really holding a jackhammer but doesn't pogo stick seem a little happier?). K. found this in a playground this morning and is quite attached ... wouldn't you be??? I'm pretty sure we could take this from him, hide it, and give it back on his birthday and be exempt from having to give him any other gifts. In case you're wondering (and want to go get one for yourself)... the awesome alien is a shade of pink, in the right light, and about 1/2" tall ... and house trained and very quiet.